Rudraksh Bracelet Rakhi And Roli Chawal. Rudraksh Rakhi along with scintillating Ferrero Rocher chocolates seems like a perfect combination of traditional and modern affairs. 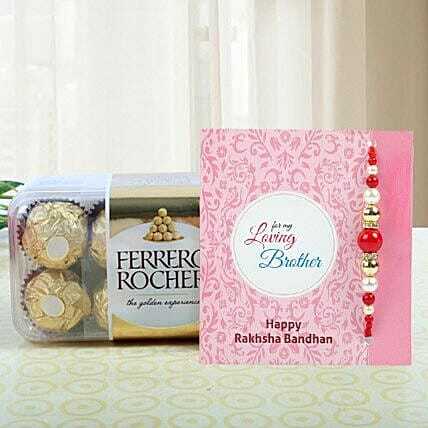 The traditional Rudraksh Rakhi would take care of the health of your brother and he can wear it for a lifetime while the Rocher chocolates would provide enough taste to his buds! So, get this hamper right now.